Yes, injector timing isnt relevant - you can squirt fuel in at anytime and it should still run. If you havent done so you need to confirm there is reasonable fuel pressure in the rail too. A 4 stroke engine cycle is 720 degrees. In a road engine, Inj timing is more for drivability and ecomomy etc but around 400deg is common. Most engines will run best when all of the fuel is injected before the intake valve opens, this is about 400°BTDC. Do I need to have the pullup resistor on for the e85 sensor? So turned the pull-up on and now the E85 sensor is green so guess I'll leave. Set your aux 1 fuel pump polarity to low. ok, so now you need to look at your fuel pump and wiring. Do you hear it prime at key on? So had the auto elec out home today looking at the fuel pump issue. He was able to get the pump to run but it won't stay running. He says the wiring is correct????? But says it keeps turning off due to the ecu for some reason. He's gone to look on his laptop to search for this reason. Any idea from your end? When he's trying to test it just set the fuel pump output (aux1?) 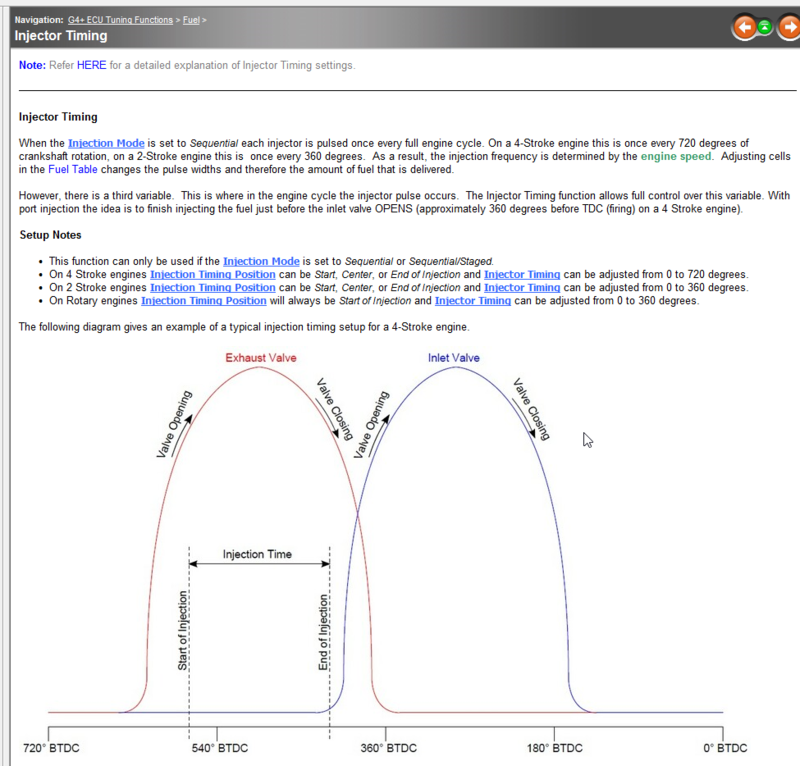 to "test (on)" and then flick polarity to high or low until it works. You could do the same thing if you've got the pipe at the fuel rail pulled off nad pointing at a bucket, with key on, one of those settings should send fuel everywhere (and then set it back to "fuel pump" and set your polarity based on what you find). If neither high or low polarity makes it run flat out, there is something in the wiring (are the relays wired up right, is there a secondary FP controller?) or your pump is faulty. It's a brand new pump so highly doubt that and he did do something to get it to work to remove the pump from the equation. He has been fabulous with the wiring the loom is bang on and even labelled everything for what it is. So spoke to the auto elec again and he said the high setting is what it needs to be on but he did the same thin with switching high and low to get it to work and he is still certain that it's a program issue. He says it triggers for a split second when you crank then doesn't trigger it again. Is there something else I'm missing in the programing ? As I'm at a loss ATM bad. 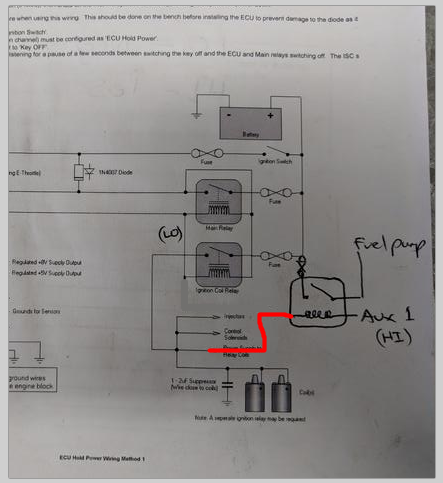 It is very unusual to need a "high polarity" for a fuel pump as that would mean it is a normally closed relay which could be quite dangerous (if a wire falls off or breaks the fuel pump will default to on). Can you get the sparky to draw a quick diagram of how the fuel pump relay is wired. Easiest way to get pictures on a forum is to use a host. Go here: https://postimages.org/ Upload your photo, it will then give you a whole list of links. Copy the named "hotlink for forums" then paste it into your message here. Please find picture attached on how the fuel pump is wired. that's not how I wire fuel pump relays... put one side of the fuel pump relay coil to ignition switched 12V, connect the other side of the coil to Aux 1 and set Aux 1 as fuel pump with a low side drive. 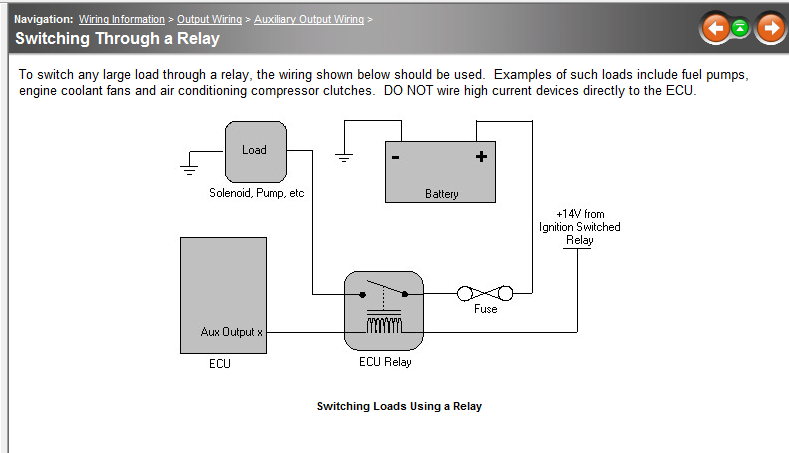 So you will need to power one side of the relay coil from a switched +12V, the ECU grounds the other side. I'll send him that picture. So could be as simple as changing that one wire? If I change this wire around sometime this weekend and it works do I run it on low or high?